Posted by Dave Emory ⋅ March 25, 2015Post a comment Email This Post Print This Post Tweet This! Furthermore, anyone who dares to discuss this and its relevance to the OUN/B heirs installed by the Maidan coup is labeled as, at best, a “dupe” or, at worst, an agent of an enemy propaganda machine. Now, things have disintegrated still further. There is a cyber warfare/cyber propaganda offensive underway by Ukraine and its NATO allies, apparently being spearheaded by a U.S. Special Forces and cyber-warfare vet named Joel Harding. Sadly, Harding seems to have had a pretty realistic grasp of American political and rhetorical reality (see below) as recently as 2012, if we can judge by his pronouncements. Now, however, he castigates critics of U.S. and Western support for the OUN/B heirs dominating Ukraine in the strongest terms. Harding also appears to be directing active interdiction and propaganda efforts against those critics, who face something that might be called “cyber-McCarthyism.” One wonders if this will be accompanied by actual physical violence against critics of U.S. and Western Ukraine policy? We also wonder if recent difficulties experienced by Robert Parry’s Consortium News website has anything to do with the substance of George Eliason’s allegations? We have used numerous articles from that website on the subject of Ukraine. We note in passing that we view the overwhelming majority of the websites and individuals cited as targets by George Eliason with a jaundiced eye.We also remind the casual reader that we are very supportive of the NSA and GCHQ in “L’Affaire Snowden.” We also believe that the Underground Reich attack on NSA/GCHQ and its attack on Russia/Eastern Ukraine are part of the same “mega-op.” We MIGHT be the only folks on earth who are very supportive of both Russia vis a vis Ukraine and NSA/GCHQA vis a vis Snowden/WikiLeaks. Nonetheless, we feel that the implications of this story are sinister. Programs covering the Ukraine crisis are: FTR #’s 777, 778, 779, 780, 781, 782, 783, 784, 794, 800, 803, 804, 808, 811, 817, 818, 824, 826, 829, 832, 833, 837. “Can the Ukrainian Government Target American Journalists in America?” by George Eliason; OpEd News; 3/19/2015. If you have a website, write, read, or like something in social media that strays outside the new lines the war isn’t coming, it’s now here. IO or IIO (Inform and Influence Operations) defined by the US Army includes the fields of psychological operations and military deception. In military IIO operations center on the ability to influence foreign audiences, US and global audiences, and adversely affect enemy decision making through an integrated approach. Even current event news is released in this fashion. Each portal is given messages that follow the same themes because it is an across the board mainstream effort that fills the information space entirely when it is working correctly. The purpose of “Inform and Influence Operations” is not to provide a perspective, opinion, or lay out a policy. It is defined as the ability to make audiences “think and act” in a manner favorable to the mission objectives. This is done through applying perception management techniques which target the audience’s emotions, motives, and reasoning. These techniques are not geared for debate. It is to overwhelm and change the target psyche. Using these techniques information sources can be manipulated and those that write, speak, or think counter to the objective are relegated as propaganda, ill informed, or irrelevant. According to his own bio- Joel spent 26 years in the Army; his first nine years were spent as an enlisted soldier, mostly in Special Forces, as a SF qualified communicator and medic, on an A Team. After completing his degree, Joel then received his commission as an Infantry Officer and after four years transitioned to the Military Intelligence Corps. In the mid 1990s Joel was working in the Joint Staff J2 in support of special operations, where he began working in the new field called Information Operations. Eligible Receiver 1997 was his trial by fire, after that he became the Joint Staff J2 liaison for IO to the CIA, DIA, NSA, DISA and other assorted agencies in the Washington DC area, working as the intelligence lead on the Joint Staff IO Response Cell for Solar Sunrise and Moonlight Maze. Joel followed this by a tour at SOCCENT and then INSCOM, working in both IO and intelligence. Joel retired from the Army in 2003, working for various large defense contractors until accepting the position with the Association of Old Crows. According to TechRepublic –The career of Joel Harding, the director of the group’s (Old Crows) Information Operations Institute, exemplifies the increasing role that computing and the Internet are playing in the military. A 20-year veteran of military intelligence, Mr. Harding shifted in 1996 into one of the earliest commands that studied government-sponsored computer hacker programs. After leaving the military, he took a job as an analyst at SAIC, a large contractor developing computer applications for military and intelligence agencies. Joel Harding established the Information Operations Institute shortly after joining the Institute at the Association of Old Crows; he then procured the rights to InfowarCon and stood it up in 2009. Joel is an editor of “The IO Journal”, the premier publication in the field of IO. Joel formed an IO advisory committee, consisting of the 20 key leaders from Us and UK corporate, government, military and academia IO. Joel wrote the white paper for IO which was used as background paper for US Office of the Secretary of Defense’s QDR IO subcommittee. For ten years the Association of Old Crows has been the Electronic Warfare and Information Operations Association, but there has been no concerted effort to rally the IO Community. This has changed, the IO Institute was approved as a Special Interest Group of the AOC in 2008 and we have already become a major player in the IO Community. This is especially important with the recent formation of the US Cyber Command, with the new definition of Information Operations coming out of the Quadrennial Defense Review, with a new perspective of Electronic Warfare and a myriad of other changes. The IO Institute brings you events, most notably InfowarCom. Our flagship publication is the IO Journal, already assigned reading by at least two military IO educational programs. IO classes are integrated with Electronic Warfare classes to educate, satisfy requirements and enable contractors to be more competitive. When you look at the beginning of the NSA’s intrusive policies you find Joel Harding. Harding helped pioneer the invasive software used by government and business to explore your social networks, influence you, and dig out every personal detail. In Operation Eligible Receiver 1997 he used freeware taken from the internet to invade the DoD computers, utilities, and more. It’s because most of it is based in “freeware” that NSA snooping has a legal basis. If you can get the software for free and use it, why can’t the government use it on you? Looking back at Joel Harding in 2012 seems like a different man. This is the same accomplished professional described above before Maidan. Here’s how he describes the Russian, Chinese, and American experience before his involvement in Ukraine. Joel Harding has quite a different opinion in 2014 after taking control of Information Operations (IO) in Ukraine. On February 28th 2014 he was announced director of the NSE Strategy Center. Harding reached out immediately to the IO community to see what information anyone had on current Russian cyberspace operations. On March 1st 2014 Harding announced cyber options for Ukraine. In early March 2014 US President Barrack Obama issued an executive order stating anyone challenging the legitimacy of the new Ukrainian government was subject to US sanctions including US citizens. The way it is written journalists in the US wondered if they would be put on a terrorist list. On March 3rd, only a few days into the new job Harding’s advice was “Now I have a thought bouncing around inside my head, which actually makes sense. But the repercussions are wild, off the charts, bloody and may destroy a nation. ..If one looks at that graphic, natural gas pipelines run through Ukraine. If one had the talent, one could close valves in any of those pipelines and shut down a major part of Russia’s exports and, therefore, a source of money, another kind of power which Putin must truly understand. Bumping this up one step, blow up those pipelines, although that is going to make one helluva mess. This would result in a Russian invasion. End of story? No. Imagine trying to defend thousands of miles of pipeline. Ukrainian insurgents would make Russia devote dozens of divisions of soldiers…” At the time Victoria Nuland was trying to court Pravy Sektor into legitimacy by offering money and support. On March 16th Dimitri Yarosh answered. Yarosh threatened gaslines across Ukraine. The advice Harding gave threatened one of the only remaining sources of income remaining in Ukraine for the Kiev junta. From that moment on Harding geared his public writing to Ukraine. He provided military advice, the unified press stories Ukrainian media put out, IO cyber tactics, military manuals, psy-op manuals, and unified the large international press cover the Eastern European emigre populations provided. Behind the scenes beyond creating new government ministries it’s easy to fathom the impact he is having. Throughout the past year Harding and others fleshed out the Ukrainian version of democratic “free speech” based on how he has concluded it should be in the USA. On December 12th 2014 Harding wrote “Ukraine is a bright shining star. They approved a Minster of Information Policy. They received a National Information Strategy and are working on a counter propaganda center. Hopefully they are going to remove the paywall at KyivPost.com.” – Kiev Post did just that. They Read Joel Harding? OSCE Representative on Freedom of the Media Dunja Mijatovic is critical of Kiev’s decision to create the new ministry. Under Ukrainian law journalists that disagree with Kiev’s policies are collaborators. 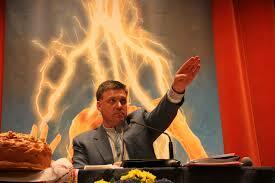 They are subject to any mechanism Kiev can devise to stop them. In the case of RT Ruptly or the Guardian this means developing a strategy to ruin their reputations. The Interpreter was developed to that end. Kiev has gone so far as to petition the UK government to censure the Guardian for its coverage of events in Ukraine hoping to bully the publication into line. US broadcasters (Radio Free Europe/Radio Liberty) have put RT on the same list as ISIS. Since Harding’s definition of propaganda is “any news coming out from your opponent”, a propagandist would be tightly defined as the enemy operative that writes the news. In this view any journalist or news outlet; both mainstream and alternative that publishes articles or video going against his agenda is propaganda or worse -active measures. It is the term “active measures” below that needs to be keyed in on. Almost all of Joel Harding’s professional career has been devoted to Information Operations and developing a cyber offense to combat terrorists. A person employed in “active measures” according to its definition is committing political warfare against the USA , is a terrorist, and their writing is just short of a hot war. The writings of 1976 Nobel Peace Prize Laureate Mairead Maguire fit the bill describing a terrorist that is working to overthrow the US government because she writes about the injustices done in Gaza, and Syria. Private citizen Joel Harding has used both his connections and training as an SF soldier to create a private foreign IO army which today is over 40,000 strong with the sole purpose of destroying publications, journalists, and people that “he deems” as supporting Russian propaganda and people engaged in “Russian active measures.” Add into this that Harding wrote the white paper the doctrine of US Army Cyber Defense is based in, he pioneered the field of cyber warfare, developed the means and methods of the NSA and you have one of the most formidable practitioners on the planet. People spread throughout mainstream media that came after him were taught or mentored by him, his colleagues, and belong to the groups and associations he leads. Long story short, if you write about social justice like Mairead Maguire, you are a targetable terrorist. It has been decided by private citizen Joel Harding. Today Ukraine is his project and if you are writing about it that’s what you stepped into. In truth it doesn’t matter what you write about, his minions cover everything corporations and governments have an interest in. Ukraine isn’t the test case, America was through the NSA. America failed miserably guarding responsible free speech. Ukraine is the first full scale rollout operation. The people and methods employed will continue long after the Ukraine War is over if they win the information war we are all in. Take it from someone who was hearing military drones 2 or 3 times a week for months, spent a month in a town “occupied” at times by both Pravy Sektor and the Natz Guardia, whose home shook for months because of the artillery and rockets, and at the end of that occupation found themselves only hours from becoming another “cleansing casualty” before we were rescued. As much as I have written about these things I had to leave many things unsaid. From my experience YOU, where ever you are would rather face 100 men with the capabilities of Navy Seals, or Delta Force and heavy weapons than just 10 men with ¼ of Mr. Harding’s capabilities, intelligence, and connections. In the end 100 extremely trained warriors remain 100 men. Within months Harding has turned very few into a highly focused 40,000 and most of the propagandists he writes need to be dealt with by his army are Americans on American soil. That army is going to work influencing millions to go to war with Russia. How Far Will Ukraine’s King Troll go to destroy You? “They probably have been really frightened by the idea of bearing criminal responsibility sooner of later for their actions or for becoming persona non grata in the civilized world,” Herashchenko wrote. It is also noteworthy that foreign intelligence services have become interested in the Peacemaker site — the CIA, FBI, European intelligence and counterintelligence. The reason in simple. The civilized countries, drawing on information on the pro-Russian militants-terrorists, will be able to create their own databases of suspicious persons and individuals that must be neutralized and isolated from society, he said. If you, like, Mairead Maguire are employing Russian active measures according to Harding’s definition, you are the Russian secret services he is talking about. She doesn’t write about Ukraine. You are the people to be isolated from society, “suspicious”, that must be neutralized. You are the journalists, activists, or people who read alternative news that must be put on lists with the CIA, FBI, INTERPOL, intel, and counter intel. Throughout 2014 Harding made it clear that journalists, writers, and scholars that publish articles at GlobalResearch were agents engaged in Russian propaganda and active measures. Like the labeling of Mairead Maguire it doesn’t need to be written remotely concerned with Ukraine, Donbass, or Russia, just against his agenda. Global Research is a constant focus of his IO disrupt and destroy work through his private Cyber army in Ukraine. These are only a few of the websites that have been targeted for attacks as Russian propaganda and active measures. The very recent jump in spam comments is just the beginning of a large unified effort. Topping the list in terms of importance is Congressman Alan Grayson who has been an outspoken opponent of intervention in Syria as well as Ukraine. Perhaps someone should tell him he’s being watched. Every Congressmen that is against interventionism or for human rights should look into why a private citizen can grind axes with Americans using a foreign government/ private IO army he is creating. It is in part a branch of the Ukrainian Military and under a ministry of the Ukrainian government that Harding helped create. He is also steering its efforts. Peppy Escobar and Steven Lendman are both “active measures” agents for writing about John Kerry, the State Department, RT bashing, and of course Ukraine. Blog talk Radio host Dr. Rick Staggenborg both a veteran an d peace activist is labeled a Russian propagandist. Professor Michel Chossudovsky and every journalist and activist that publishes at GlobalResearch.ca which is a large list including Paul Craig Roberts and Robert Parry are Russian active measures agents in the Ukraine war and every “agendized news event they write on. Tyler Durden, connected writers and journalists are Russian propagandists. Deena Stryker, an editor at OpedNews is noted because of her PressTV interview for saying the US is engaged in a propaganda war. All conspiracies aside it wouldn’t feel right without adding Alex Jones and Michael Rivero. Harding developed what seems to be a fixation about Jones and company a few years back. It’s not that he hates Jones’ news sites any more than the others, but it is personal. Joel Harding’s favorite nephew rates Jones take on international events as more credible than what Harding has to say. George Eliason – As for those documents, Eliason must have contacted the cyber-militia directly, because they haven’t made any public posts online since December. All of this was unusual enough to warrant further investigation into George Eliason’s online identity. Only a short year ago very few people could even point out Ukraine on a map. During this past year an American has given the government and military of Ukraine the power and tools to attack people in the United States, Europe, and where ever you are reading this. The people listed are only a few of many. If you have a blog, website and write about current events, you are included too. It shows is an across the board monolithic effort to destroy alternative news and free speech, journalists, and activists. If you are writing about Ferguson and police brutality, human rights, or responsible government -How how long does an organized IO army need to destroy your reputation, income, and work when its focus- is YOU. Whats next? Wait and see. Mr. Harding, will it be assassination or character assassination? Will you hand this over to your Ukraine Nazis or Pravy Sektor? Can you adequately respond to why you a private citizen can make Western journalists “bad guys, terrorists, Russian political warfare combatants and therefore targets in your war?